This book was sent to me from the author, Carole P. Roman, for free. This book was sent to me through Bostick Communications. Carole P. Roman sent me this book in exchange for an honest review. Synopsis: Join Carole P. Roman and travel through time to visit the most interesting civilisations throughout history in the first four books of her new series. Learn what kind of food you might eat in Ancient Greece, the clothes you wore in 15th Century Renaissance Italy, what your name would be in Elizabethan England and what Colonial American children did for fun. If you were me and lived in ... does for history what her other award winning series did for culture. So get on board this time travel machine and discover the world through the eyes of a young person just like you. 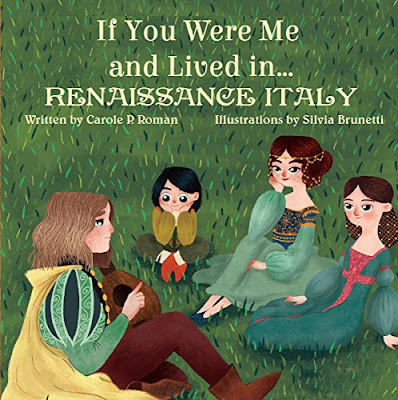 Review: I would like to thank Carole P. Roman for sending me a copy of this book in exchange for an honest review.This is a very interesting and educational book for children. This book and the rest in the series are a good way to teach children about history and places around the world. Carole P. Roman has written many great children's books that I would highly recommend to anyone who sends a prolonged amount of time with young children. These books are written in a simple story line but they are also factual and informative about places and historical periods of time. As I do not have children I have passed this book and others that I have been sent onto a neighbour for her son. Also, I give some of these books to my niece and nephew.